As my expectation of [an annually made] pumpkin pie arriving at my house for Thanksgiving dessert was dashed, thanks to someone who usually brings the pie but never offered this year (bitter much? ), I quickly had to come up a new plan for a second dessert. And it needed to involve only ingredients that I had in my house because I refused to venture into the madness of a grocery store last Wednesday afternoon. 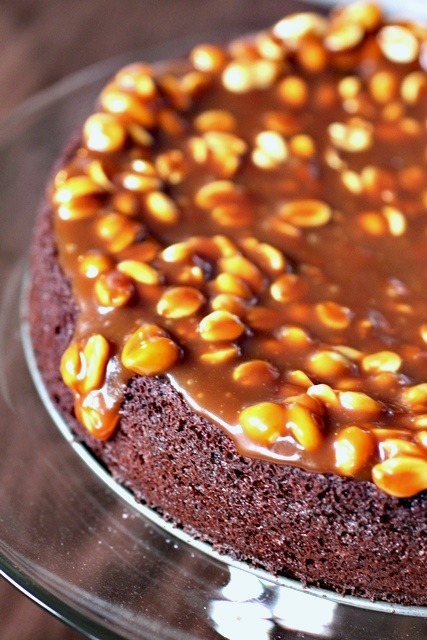 I dug deep into Dorie Greenpan’s Baking book and came up with her Caramel Peanut-Topped Brownie Cake. It’s one I’d seen Annie make a while back and always admired for its gorgeous presentation, and I decided on the spot that it was time to make it. As it turns out, this cake was way easier to make than I expected it to be (even in such a pinch on the night before Thanksgiving) and I’m definitely starting to feel more comfortable making caramel. I love watching all the bubbles while the sugar boils away! Dorie, of course, couldn’t make the process any easier with her precise and perfectly detailed instructions. The caramel-peanut topping is to.die.for and while I think I slightly overbaked the brownie cake, the combination was a delightful one…as expected. Personally, I think the cake could have been a little sweeter so I think I’ll use a combination of semi-sweet and milk chocolate should I make it again in place of the bittersweet chocolate. But the caramel topping was just as ooey-gooey as I had hoped it would be so how could I possibly complain about anything else? Nobody missed the pumpkin pie this year when I had a dessert table set with Tall and Creamy Cheesecake, Cappuccino Biscotti, and this outrageous Caramel Peanut-Topped Brownie Cake! Center a rack in the oven and preheat the oven to 350° F. Butter an 8-inch springform pan, dust the inside with flour, tap out the excess and line the bottom of the pan with a piece of parchment paper. Place the springform pan on a baking sheet. To make the cake, combine the flour, baking soda and salt in a small bowl; whisk together and set aside. Add the butter and chocolate to a heatproof bowl set over simmering water. Heat, stirring occasionally, until the ingredients are just melted – do not let them get so hot that the butter separates. Remove the bowl from the heat and set aside. In a large mixing bowl, whisk together the eggs and sugars until well blended. Whisk in the corn syrup, followed by the vanilla. Add in the melted butter and chocolate mixture, and whisk until combined. Gently whisk in the dry ingredients, mixing only until they are just incorporated. The batter should be thick, smooth and shiny. Pour the batter into the prepared pan and jiggle the pan a bit to even out the batter. Bake for 40-45 minutes or until a thin knife inserted in the center comes out almost clean. Transfer the pan to a rack and cool for 15 minutes, then run a thin knife between the cake and the pan and carefully remove the sides of the springform. The cake may have puffed up during baking, but don’t be concerned if it develops a crater in the center while cooling. Allow to cool to room temperature. When the cake is totally cool, invert it, remove the base of the pan and peel off the parchment paper. Turn the cake right side up onto a serving platter. To make the topping, combine the sugar, water and corn syrup in a medium heavy-bottomed saucepan, stirring just to combine the ingredients. Place the pan over medium-high heat. Heat, without stirring, until the caramel turns deep amber, 5 to 10 minutes depending on the size of your saucepan and the intensity of the heat. As the sugar is caramelizing, wipe down any splatters on the sides of the pan with a pastry brush dipped in cold water. To test the color of the caramel, drop a bit onto a white plate. Don’t be timid about the color – if it’s too pale, it won’t have much flavor. Lower the heat a bit and, standing back from the saucepan, add the cream and butter. When the spatters are less vehement, stir to calm down the caramel and dissolve any lumps. Stir in the peanuts and pour the caramel and peanuts into a 1-quart Pyrex measuring cup or a heatproof bowl. You will have more caramel than you need, but you want to get all of the peanuts onto the cake, so spoon all of the peanuts out of the hot caramel and onto the top of the cake. Pour or spoon enough caramel to cover all the nuts, drizzling a bit over the edges of the cake for presentation. Allow the topping to set at room temperature, about 20 minutes, before serving. Keep the leftover caramel at room temperature and save for another use. Oh goodness this looks divine! Brownie, peanuts and caramel!? Quite a fabulous dessert you whipped up at the last minute there! YUMMY. This cake looks fantastic! I’ll have to make it soon. These brownies look awesome! I love the chewy caramel peanut topping. This looks heavenly! I’m making it the second I’m done with Weight Watchers! (Wow – I’m going to be a big success aren’t I?) PS – I made your Sour Cream Apple Crumb Cake for Thanksgiving and it was a HUGE hit! Be still my chocolate cravings! Beautiful and looks sooo tasty. Must make this ASAP. Oh my….. I can just imagine how wonderful that dessert is. It’s like a candy bar, only better. it looks mouthwatering… loved it.. Seriously. Wow. If I thought I could control myself around this at all in any way, I would make it tonight. I wouldn’t ever miss pumpkin pie with this around. Wow, this sounds and looks amazing! I love Dorie’s recipes too! Mmmmm, everything for my sweet tooth in a recipe! Wow. That looks really delicious. Congrats on the top 9! This is one outrageous looking cake, it looks so good, I will have to make this for sure and thanks for the tip about making it a bit sweeter, I am sure I would agree!